Two years ago, Andy Cabic, heading Vetiver, dropped the superbly crafted To Find Me Gone, the band’s second album. Although the record followed in the folk footsteps of its predecessor, Cabic & Co. seriously widened the scope of the project by injecting elements of psychedelic pop, but Cabic and producer Thom Monahan envisaged going even further by experimenting with electronic textures. Teaming up as Neighbors, it is exactly what they have done with You May Be Blue and Been So Long, two of the album’s undeniable highlights. Remixes collects these two radically different versions. Clocking at well over eight minutes and dressed in vaporous soundwaves, You May Be Blue is, in its first part at least, a warm and spacious ambient piece. Yet, as soon as Cabic’s voice, left very much untouched, rises, the Vetiver stamp is strongly imprinted on this version. Adding to the impression of familiarity is the beat which, although beefed-up slightly, remains close enough to the original. Building on the ethereal harmonies that gave the original its rich tones, yet remained very much in the background, Been So Long is presented in a much more atmospheric and loose form here. Stripped entirely of its lyrics, the track, which, in its album strip was already a reworking of a song featured a year earlier on the Between EP, becomes a haunting song, the addition of oriental flourishes adding to the overall impression. While the band’s third album, made up entirely of covers of tracks having influenced their work, is announced for the spring, this EP proves a worthy interlude. 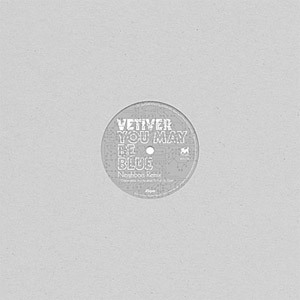 While not necessarily in keeping with the band’s usual sound, Remixes undoubtedly bears the marks of Vetiver and could provide some insight into the future of the band.